A great option for Sunday morning breakfast. Preheat oven to 375°. Line a 12-cup muffin pan with paper liners. In a blender, pulse almonds into fine crumbs. Pass through a fine sifter. Place remaining almond chunks into the blender and re-blend, continue this process until all the almonds pass through the sifter. (Note: It is very important to obtain a superfine particle for this recipe to achieve the proper texture.) Reserve. In a medium bowl, beat the butter, honey, 2 egg yolks (reserve the whites), banana, vanilla, orange juice, orange zest and orange segments. In another bowl, sift the ground almonds, corn starch, salt and baking soda together. Thoroughly combine the dry mixture into the wet mixture. In a medium bowl, beat the egg whites until stiff peaks form. Fold the egg whites into the almond mixture. 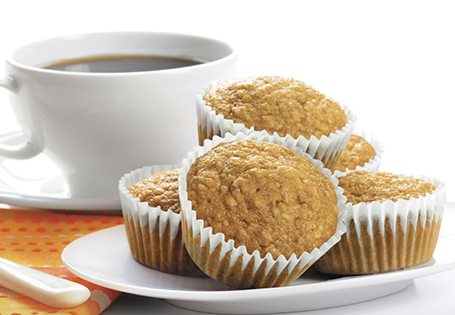 Distribute the mixture evenly among the prepared muffin cups. Bake for 12-15 minutes, or until a toothpick inserted comes out clean. TIP: Use the pulse option on your blender when making almond flour. If the blades heat up too much, you will end up with almond butter. While delicious, it won't be usable for this recipe.